Monitor your network in real-time down to the interface level with up to one-minute granularity. Identify which users, applications, protocols, or IP addresses are consuming the most bandwidth. Schedule an in-depth analysis of months, days, or minutes by diving into any network element. Create, schedule, and deliver extremely detailed network traffic and bandwidth reports with ease. Network bandwidth management is a vital activity for every network engineer. With real-time network bandwidth monitoring that analyzes everything through to the interface level, you have the ability to identify which users, applications, and protocols are consuming the most bandwidth. 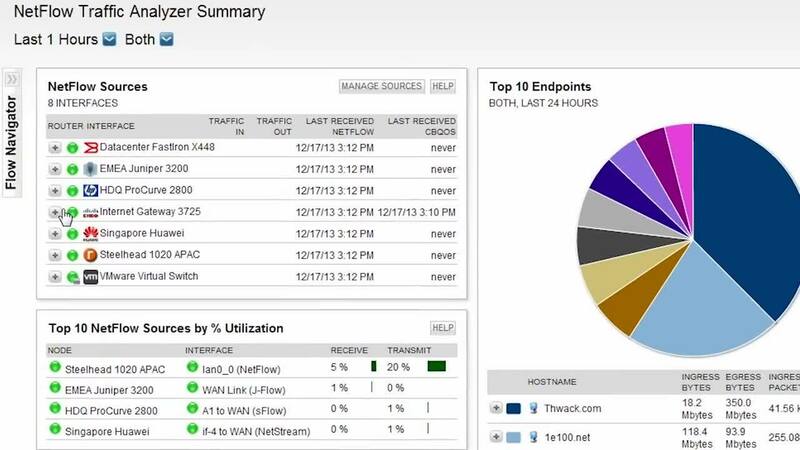 Get reports of your traffic patterns with up to one-minute granularity with NTA, the NetFlow analyzer from SolarWinds. A network bandwidth monitor captures and analyzes the flow data – Cisco NetFlow, Juniper J-Flow, sFlow, Huawei NetStream, and IP FIX – that is built into most routers. NetFlow monitoring converts that data into easy-to-interpret charts and tables that quantify exactly how the network is being used, by whom, and for what purpose. Identifying which users, applications, protocols, or IP address groups are consuming the most bandwidth is an essential part of delivering better quality service. A network bandwidth monitor can be implemented in networks of all sizes where the network professional would like insight into bandwidth usage. NetFlow analysis can be programmed over the course of months, days, or minutes, allowing you to gather long-term and short-term sets of data. With NTA, you're just clicks away from being able to create, schedule, and deliver in-depth network traffic and bandwidth reports.